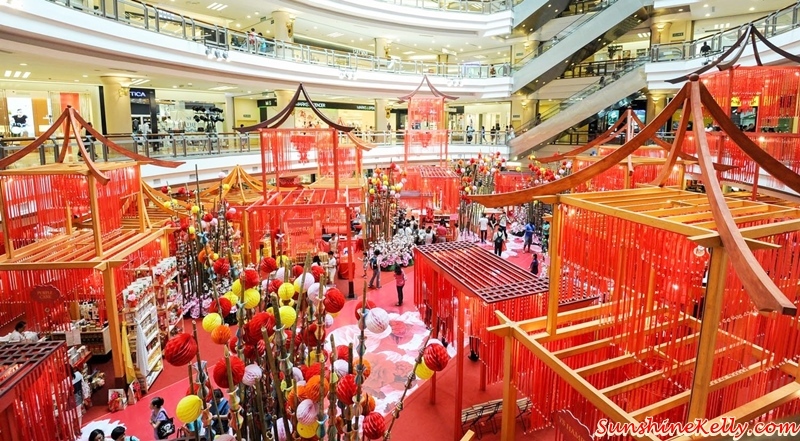 Here is the Time To Flourish Chinese New Year festive décor at 1 Utama Shopping Mall from now till 10th Feb 2016. As you can see there are many bright colors such as crimson and pink in the brilliant lanterns hung outdoors and around the mall, in the bejeweled tassels adorning the walkways that shout prosperity and exuberance. Plus the bright red ribbon that symbolizes tides and family. The main décor is at the Lower Ground Floor Oval concourse with tall oriental structures and arches with recycles material and functional decorations. These wooden towers are built to also house festive shopping kiosks for visitors to shop and walkabout. The festive mood is further set with real bamboos, a kaleidoscope of colourful honeycomb paper lanterns and bouquet after bouquet of giant peonies and flowers to mimic the floral spring time lunar season. 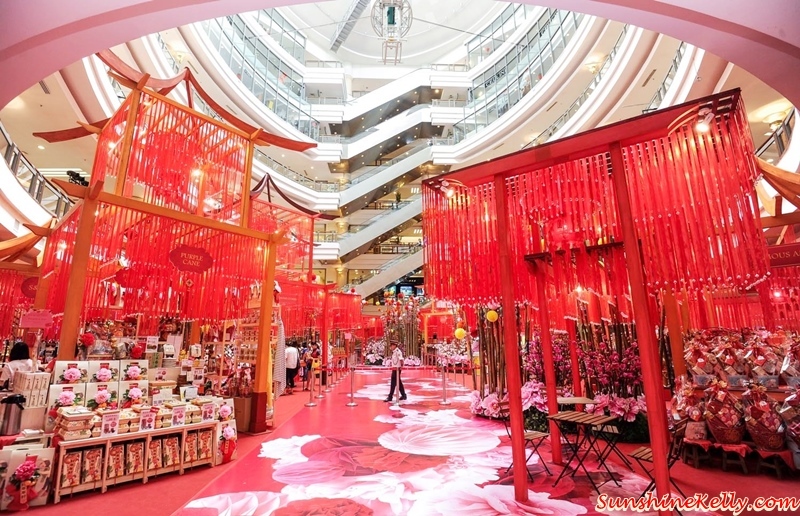 There are 36 pop-up stores that sell mainly Chinese New Year related merchandise such as hampers, cookies, cheong sam, gifts and many more. 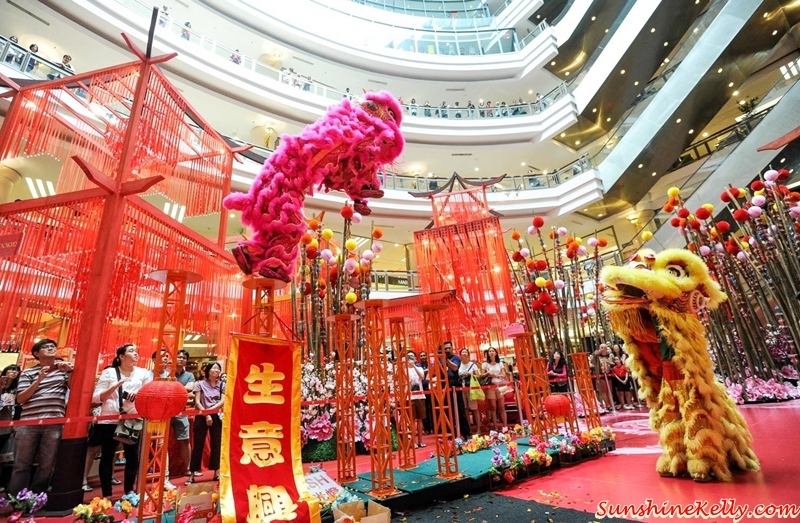 During the festive period 1 Utama has invited three famous lion dance troupes to perform throughout the month, which include Hong Teik Acrobatic Lion Dance 2015 National Champion, Kun Seng Keng Acrobatic Lion Dance and Khuan Loke Acrobatic Lion Dance. Other must-see cultural performances lined up are the Flying Diabolo, The Orang Orang Drums and 24 Festival Drums. Details schedule please refer to 1 Utama Website. By the way, did you know that as ONECARD member you get more privileges and rewards. If you are a ONECARD member you will be receiving lots of ‘prosperity’ when you shop at 1 Utama during this festive period. Enjoy an Angpow rebate of RM10 in UPoints per member per day when you spend an accumulative purchase of RM300 on the same day. *Maximum of 5,000 (RM50) UPoints per member throughout promotion period. Here is more rewards to some of you. For three days only, ONECARD members born in the Year of the Monkey will get an extra RM5 UPoints rebate with minimum spending of RM300 in accumulative receipts. *Maximum 500 UPoints Rebate (RM5) per member throughout promotion period. From 16 January - 10 February 2016, you can redeem a set of complimentary Angpow Packets with a minimum spend of RM300; or a pair of Fortune Table Mats with a minimum spend of RM800 (RM600 for ONECARD members) at any ONECARD participating outlet. Additional Fortune Pick exclusively for ONECARD members too. *T&C apply, max 2 receipts on the same day, mats limited to 200 pairs daily, whilst stocks last. As you know, 1 Utama is a family oriented mall so they will have some fun activities not only for the adults but also the kids. Here are the family-friendly workshops held at LG Oval concourse. *Limited to first 30 kids aged 4 - 12 years old for each workshop. Pre-registration required at Concierge or Customer Service Centres. Basic materials and tools will be provided. I got my OneCard. Should do my shopping at 1U since I can get everything here and get points too. love to go 1U, my fav time to go movies there. CNY gonna go see this wkend.